California Life Takes a Bite out of the Hard Rock World Burger Tour! “National Hamburger Month” here in the U.S.
To mark the occasion, Hard Rock Cafe has launched the Hard Rock World Burger Tour. 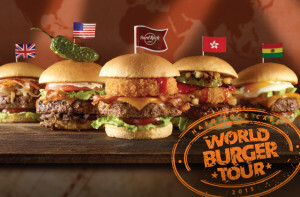 Chefs at Hard Rock Cafe’s 150 locations around the world are putting their own spin on the hamburger, and giving it a distinct local flavor. A few standouts– Germany’s “Schnitzel Burger” and Seattle’s “Java Lava Burger,” which features, among other things, an espresso-crusted patty and a fried jalapeño on top! To learn much more about the tasty creations being cooked up at Hard Rock Cafe and get tips from a pro on how to grill the perfect mouthwatering burger, be sure to watch our story below!